On March 8, 1979, as an Islamist counterrevolution was working to defeat the popular revolution that brought down the Shah of Iran, 15,000 women marched in the streets of Tehran to protest against mandatory hijab, and to demand freedom and equality for women. Once again, this criminal regime is pinning the veil to women’s heads. Only instead of metal tacks, it is using its “judiciary” to affix the scarf. Instead of nameless women in the streets, it attacks a symbolic Nasrin Sotoudeh, a well-known and respected female lawyer. And once again, this brutish regime intends to send a terrorizing warning to all women in Iran. But just as it was in 1979, so it is now: the images of hundreds women on the front lines of last year’s uprising, side by side with men, remain burned in our mind’s eye. Last week Soheyla Zaki organized and led protests in Ankara for the rights of Iranian and other asylum-seekers, going forth unafraid of the notorious Turkish police. This week Elahe Latifi, the sister of Habibollah Latifi, led a massive global rally to forestall – with hopes of ultimately overturning – the execution of her beloved brother. Women have stood and led against the Islamist counterrevolution in 1979, and they continue to do so to this day. They, who were the first target of this feral regime, have never stopped in the struggle against it. Back then, even under attack, women in Iran demanded freedom and equality. And now, under the same attack, they are still demanding freedom and equality. Back then, women in Iran raised their voices to the world, but not enough of us heard them. This time is different. Right now, the whole world can hear the voices of women in Iran. We watched Iranian women fight Basij in the streets of Tehran. Sakineh’s courageous struggle is a part of all of our lives. Women have been unmistakable figures leading in Ankara and Sanandaj. 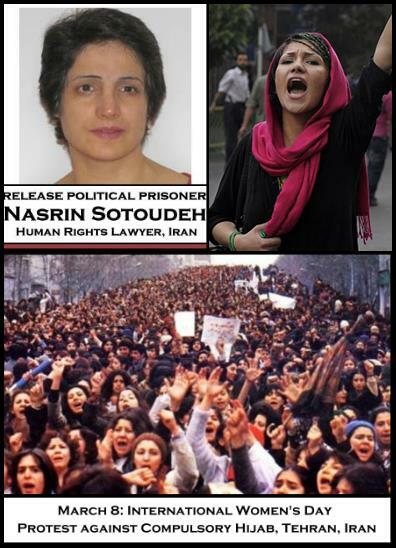 This feral regime is once again trying to pin the scarf to women’s heads, daring to use Nasrin Sotoudeh as their mannequin. This time, we, women around the world, can’t say we didn’t know. As Elahe Latifi said last night while leading the charge to save her brother’s life, “Silence is not an option.” Silence is not an option for any of us. It is time for women worldwide to stand in solidarity with their sisters in Iran.